This Business Policy and Procedure Template Manual Sampler is just that, a sample of policies and procedures from various manuals. Contents include selections from Accounting, Finance, IT, HR, Sales and Marketing, ISO Quality, Security, Disaster, and Operations. All told you receive 111 procedures and 129 forms. This 9 Manual Bundle provides 6,510 pages of content including 373 Procedure Templates and 581 Forms Templates. When sold separately the Retail price of the CEO bundle is $5,455, but when purchasing policy templates as a bundle you save $2,460 (45% off) and you pay only $2,995. This 5 Manual Bundle includes five manuals with 4,120 pages of content including 262 Combined Procedures and 374 Forms Templates. When sold separately the Retail price of the CFO bundle is $3,075, but when purchased as a bundle you save $1,080 (35% off) and you pay only $1,995. 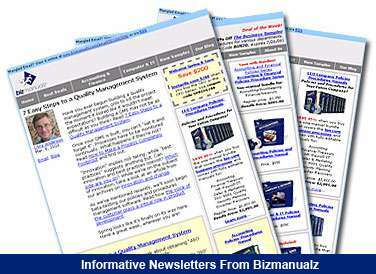 Sign up for Free Sample Policies and Procedures and you will receive an email with a link to the Bizmanualz Survey. Complete the survey and you will receive a Bizmanualz Discount Coupon Code for $50 off your purchase of a Bizmanualz Policies and Procedures manual. Manuals are regularly $595 each less the $50 Coupon is $545 for your manual. Discount programs are available for multiple purchases of any kind. If you would like to provide copies of the manuals to your clients, customers, or students, contact our Sales Department at sales@bizmanualz.com or at 314-863-5079 for details on our discount programs. Bizmanualz also offers various licensing programs for multiple use customers. Consultants, financial services firms, advisers and educators interested in using Bizmanualz material for multiple clients must obtain a suitable license granting these use rights. Please contact us for further information. Sign up for the weekly newsletter from Bizmanualz with informative articles and blog posts, tips, and special offers. You can unsubscribe any time by clicking the unsubscription link in the newsletter. The newsletter includes useful tips, special offers, and informative articles!